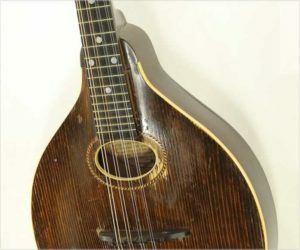 Seen here is a Gibson A-Style mandolin dating to 1918. The carved, oval sound hole top is Sitka Spruce, the sides are Maple as is the carved back. The fingerboard and bridge are Ebony. A single layer of binding was applied to the top, only – not the back, fingerboard, or head. The headstock does not have, or has lost, a Gibson logo. The original pick guard, which would have been celluloid, is long gone. 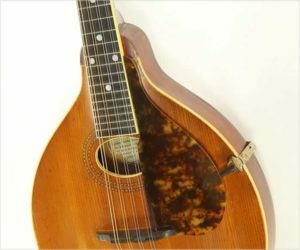 This wonderful Gibson A1 mandolin appears to be in largely original condition, and includes both the original celluloid faux-tortoise pickguard and the original hard shell case. The top is Sitka Spruce with a bound, oval sound hole, the back and sides are Maple, with Mahogany for the neck. The fingerboard and bridge are Ebony. The tuners and tailpiece are original. The top, fingerboard, and sound hole have a single layer of binding.